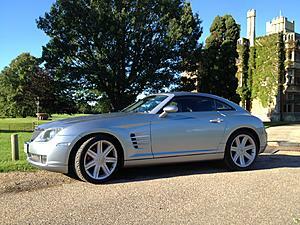 Thinking of selling your Crossfire? If you have a nice, rust free, Crossfire for sale in the UK please pm me as I would prefer to buy from someone who has cared enough for their Crossfire that they joined the forum. I am looking for a 2003 - 2006 coupé with less than 90,000 miles on the clock and a decent service history. Re: Thinking of selling your Crossfire? Hello ExFire, still looking or have you bought yet? Yorkshire man living in the Highlands has a 2003 light blue coupe 77K miles and no rust if you are still interested. Hi Longspoon is this car still for sale by any chance? Many thanks, Marvo. Hello Marvo, yes I still have the 2003 Coupe. Just completed Rotory Club North coast run, car running fine. Will part with it if pushed. Send e mail address and I will send photo's if you wish. Regards Baz. Have now found a nice 2004 Auto, 64,000 miles drives lovely and looking forward to using it as a toy! Congratulations on your purchase an welcome to the forum. Did you buy longspoons auto? I know your gonna luv it. Enjoy the (s)miles..
Hi Steve, thanks for the welcome, no I didn't buy Longspoons car although I was very tempted, a lovely car, I found this one near me and was impressed with it's condition, no rust on the rear arches nice low mileage auto box and so went for it! Congratulations on your purchase and welcome to the Forum 珞 hope you have many miles of trouble free motoring but if you have some issues The Forum should be the first place you come for answers. Hi Kingdav thanks for the welcome, trouble free, lets hope although I love to tinker with my toys so it won't be long before it's up on jacks and in bits! Just fitted a stock OEM Infinity radio from UK Chrysler spares (Lynn), very helpful, so the car is now bog standard as I prefer. I am selling a 2004 mode on black with 25k on the clock and had it since new ! Last edited by chryslerguys; 08-10-2017 at 11:43 AM. j have a 2004 mode on black with 25k on the clock and had it since new ! You guys could be made for each other, if the price is agreeable to both parties. Quick Reply: Thinking of selling your Crossfire?